"There is something evil locked behind that door!" 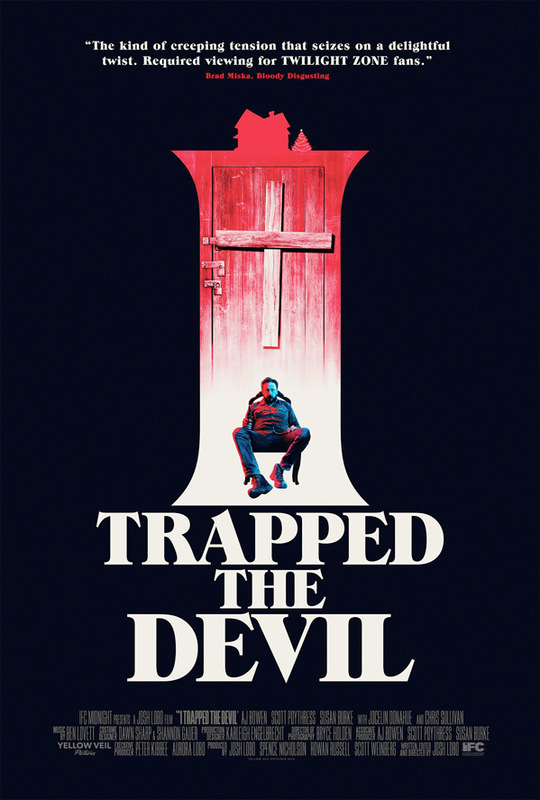 IFC Midnight has debuted an official trailer for the indie horror thriller I Trapped the Devil, an intriguing horror mystery set during the Holidays. Here's what it's about: a man descends into paranoia after trapping what he believes to be the devil in his basement, but things take a dark turn when his family (his estranged brother) unexpectedly arrive for the holidays. Is it really Satan? What is truly going on here? "Either way, the stage is set for a true Christmas from hell." This crafty horror stars AJ Bowen, Jocelin Donahue, Scott Poythress, Susan Burke, Chris Sullivan, Rowan Russell, and Josh Marrott. This looks cool. Brad Miska of Bloody Disgusting makes a Twilight Zone reference in the quote (on the poster), which makes me even more intrigued. I need to check this out. Christmas is supposed to be a time for peace and joyful family reunions. But when Matt (AJ Bowen) and his wife Karen (Susan Burke) show up unannounced at the home of his estranged brother Steve (Scott Poythress) to celebrate the holidays, they are instead greeted with a horrifying surprise: trapped in the basement is a man. But not just any man. Steve believes that his hostage is none other than the devil himself. As shock and skepticism turn to fear and paranoia, Matt and Karen find themselves facing a terrifying quandary: is Steve dangerously unhinged? Or could the mysterious stranger really be evil incarnate? Either way, the stage is set for a true Christmas from hell. I Trapped the Devil is both written and directed by filmmaker Josh Lobo, making his feature directorial debut after work in an art department previously. This will be premiering at the Imagine Film Festival later this month. IFC Midnight will release Lobo's I Trapped the Devil in select theaters starting April 26th, 2019 later this month. Who's interested?